It was a sunny morning on a spring Saturday, and I found myself in the bathroom. Yes, the bathroom. It wasn’t even 9 AM, and I found myself trembling, my heart pounding, and unable to control my anxiety. Trying to stay calm, I was making frequent visits to the bathroom just to find a nice quiet place away from the hundreds of competitors getting ready for their turn in the agility ring. It was the first day I was competing with my youngest dog, Lilu, in agility. Saying I was nervous is a bit of an understatement; in truth, I was a nervous wreck. The entire morning before our first run (which was almost three long hours after we arrived at the venue) I could not hold still. My boyfriend, bless his heart, was trying to help calm my nerves by offering me food, coffee, verbal encouragement, and even trying to give me a back massage. And do you know what I did? I asked him to stop talking to me, stop touching me, stop bringing me any food, and to just leave me alone. (I know what you’re thinking: what a b&#%h!) To the outside person, it probably looked like I was being a complete diva, giving Mariah Carey a run for her money. You might feel badly for my boyfriend, who was only trying to help by offering me some of my favorite things. But when I asked him to leave me alone, he completely understood, because I politely explained why: I knew that my nerves and anxiety were no longer just a mental “mood;” my physiology was completely out of balance. I had lost control of my body. I had no appetite, I couldn’t concentrate, my stomach was all messed up, and my senses were in overdrive. I was hyper-sensitive to touch, and felt I was going to lose it if my boyfriend told me “It’s OK” one more time. I knew what I had to do, and that was to try to re-balance my internal state. The only way I knew how to do that was the same way I help my anxious and sensitive dogs: I had to remove myself from all the stimuli. I just needed some time to myself to regain control of my body and then apply some of the breathing and calming exercises I had learned in my training. When my well-intentioned boyfriend left me alone for a while, I was able to regain control and balance myself just enough to be able to function again, and then compete. One of the many lessons I learned that day was that I had spent a huge amount of time and energy training Lilu to handle stress and perform well in spite of it, but I had forgotten all about training myself to do the same. A few weeks ago, we competed for the third time. Many of the first-time jitters were gone, so my nervousness was toned down, too; I was just nervous enough to score an awesome back massage from my boyfriend. (I may not be a diva, but I’m also not a complete idiot!) Since surviving that panicky first competition, I can honestly say I know how fearful and anxious dogs feel. Have you ever found yourself telling your dog “It’s OK” as you pet her in a stressful situation, or shoving treats in her face in hopes she will eat it to make it a “positive” experience? Have you found yourself making a trail of treats to get your dog inside an elevator, or pulling him into a “scary” place to follow up with more treats? As much as I love all the things my boyfriend was offering, those reinforcers were not making my first agility trial a positive experience; in fact, his voice and touch were painful. When an animal feels in danger or is highly stressed (as I was), its body releases the hormone adrenaline, which controls the body’s fight-or-flight response. The secretion of adrenaline starts a chain of reactions that causes the body to tense and the senses to heighten. It suppresses your appetite and slows your operant state (making you less efficient). When we’re trying to make a positive experience out of something stressful, we often quickly offer treats or something our dogs like—but we don’t stop first to consider what is going on with them physiologically. If I am working with a dog whose adrenaline has skyrocketed, my first goal is to try to decrease that adrenaline and get their body to relax before I start to offer treats. 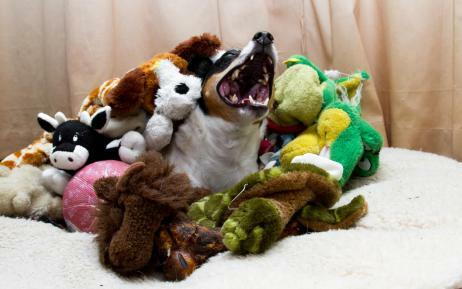 Ideally, I will set up the training scenarios so the dog can remain physically and mentally balanced even after some stressors are present, and then reward appropriate behaviors before the stress has a chance to take over. This way, the treats make it a positive experience and, importantly, the dog remembers the experience of being relaxed in the presence of the stressor. If you find yourself in my boyfriend’s shoes—unintentionally adding to your dog’s stress—take a step back, remove your dog from the stimulus, and give her a chance to get her body back in balance. 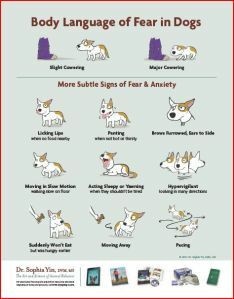 Once she is calm, you can try to create a more positive experience with that stimulus by keeping your dog at a distance where she is aware of the stimulus but it is not close enough to cause a panic attack. Clear communication is the key to building a healthy relationship with your dog. If you do not know how to recognize fear or stress in your dog, seek professional help. Below is an illustration that help you get started. Remember the two keys to a positive experience are: first, keep your dog physiologically as calm as possible, and second, pair the stressful stimulus with something your dog finds rewarding. In time, you and your dog will be enjoying the rewards of having worked together to turn a negative into a positive. Lilu and I now look forward to agility trials as an activity in which we get to spend time with “our” boyfriend, catch up with the other competitors, and­—most of all­—experience the fun and excitement of running the courses together!